Interested in fountain pens but not sure where to start? There are plenty of pens that can be had for less than $20, but what about those ultra-affordable sub-$5 pens. The Zebra V-301 Fountain Pen is one such pen. How does it hold up against the likes of its low-price counterparts? Read on to find out. Those who use Zebra V-301 Series pens and pencils will be right at home with the fountain pen version. 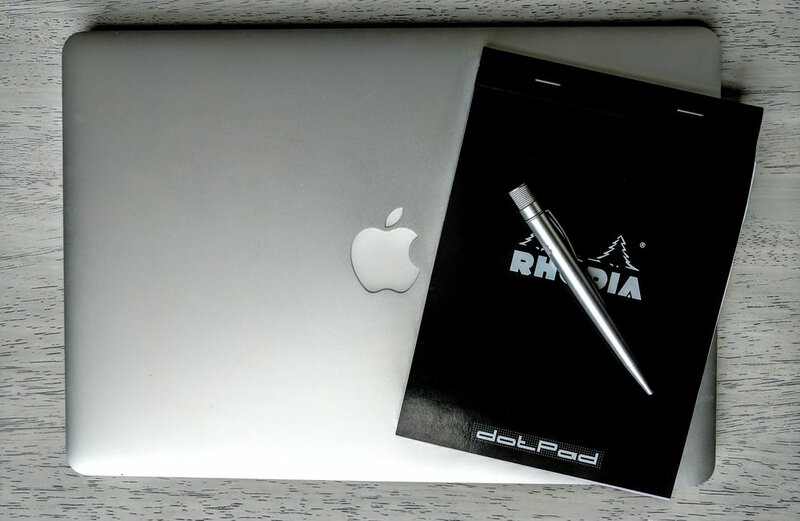 Aesthetically, the pen shares a similar design style, including black plastic grip. The ridges on the grip make the Zebra V-301 comfortable to hold for longer writing sessions, although the matte plastic is less appealing to the eye than the smooth plastic grips on pens like the Pilot Metropolitan. Still, it's a worthy tradeoff for sweaty fingers and cramped hands. For those looking to try an ultra-affordable fountain pen in the office, it's hard to recommend the Platinum Preppy, which looks as if it belongs in a high schooler's backpack, rather than a briefcase. The Zebra V-301, on the other hand, has a professional look that would fit right in, in an office environment. Two critical pieces of a fountain pen cap design are the way that the cap fits securely on the pen body and how the cap posts for writing. Overall, the Zebra V-301 posts nicely, with a solid click, but its capping experience leaves something to be desired. It does cap securely, so there's no need to fear a dry nib or ink-stained pants, but I found the Zebra V-301 occasionally difficult to cap. This seemed to get better with time, perhaps as the cap and plastic grip became worn in. One of the most interesting features of the Zebra V-301 is its hooded nib. One of the downsides of some ultra-affordable pens, such as the Platinum Preppy, is their flexible nibs, which can be easily damaged by heavy-handed fountain pen novices. The Zebra V-301, on the other hand, has a plastic hood that reinforces the back of the steel nib. The nib itself is hard-as-nails and offers very little flex. This might be a turnoff to some but offers great protection from accidental damage. The logo should be face-up, which is a small design flaw. The writing experience with the Zebra V-301 was surprisingly pleasant for a pen at its price point. The nib does run on the dry/scratchy side, and some online reviews did mention skips and clogs, but I used the pen as my daily driver for a week and didn't experience any major issues. Like the hood on the Lamy 2000, the hood on the Zebra 301 can obsure the view of the nib, making it more difficult to tell when the pen is at the appropriate writing angle. My guess is that this is somewhat responsible for the reviews that mention skips. 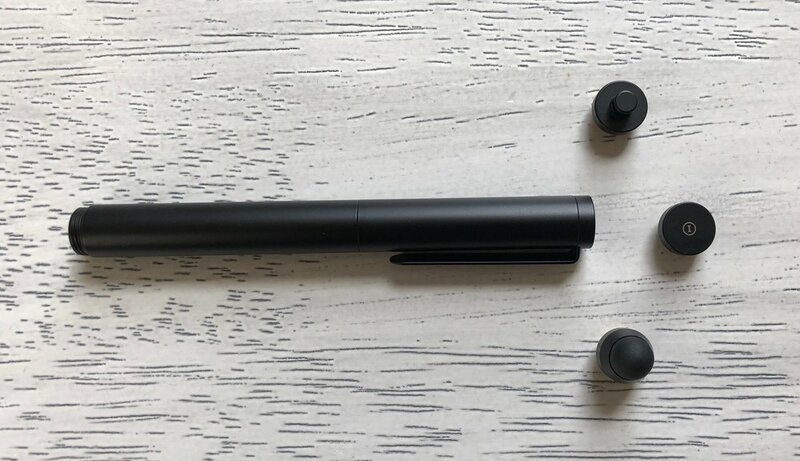 I did notice a few skips after using the pen for extended periods, but I experience the same issues when using more expensive starter pens, like the Lamy Vista. It's impossible to ignore price when considering the quality of a fountain pen. The Zebra V-301 is far from perfect, but for an average price of $3, it performs substantially well, even when compared to the Platinum Preppy. The reinforced nib makes it an excellent choice for fountain pen beginners, and the generous double ink refill will ensure that you'll have plenty of ink to put it through its paces. 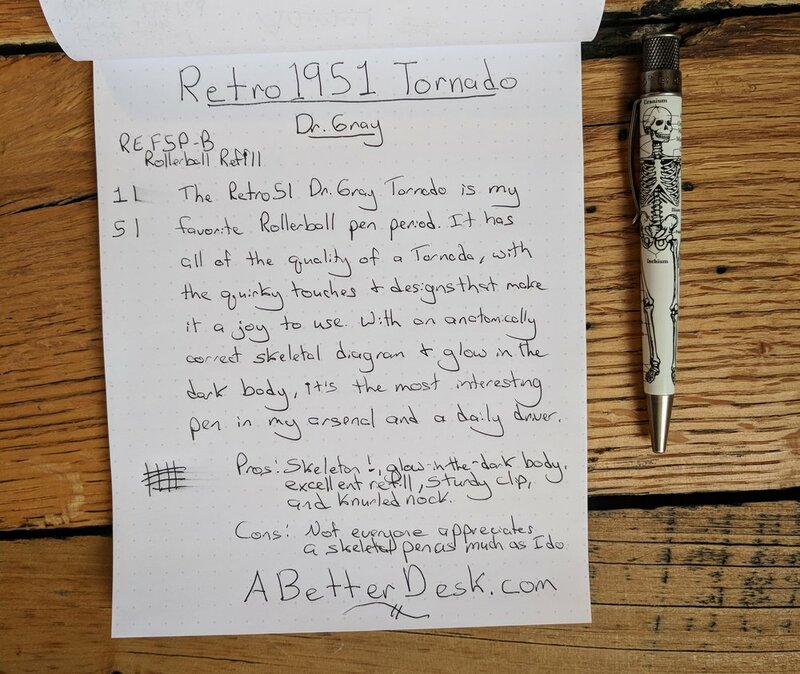 This pen was provided at no cost by For My Desk, for the purposes of this review. 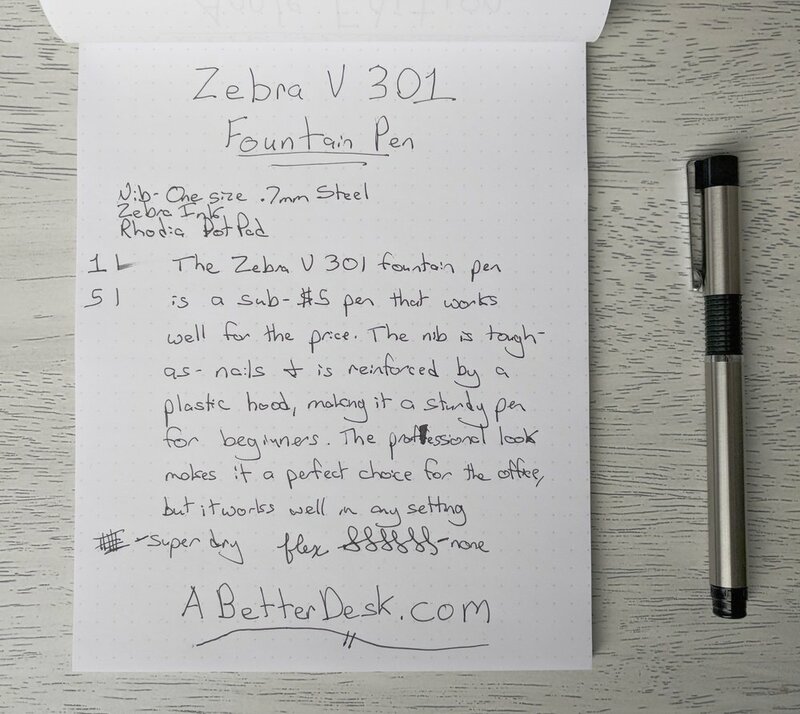 If you're interest in the Zebra V-301 Fountain Pen, check it out on their site! 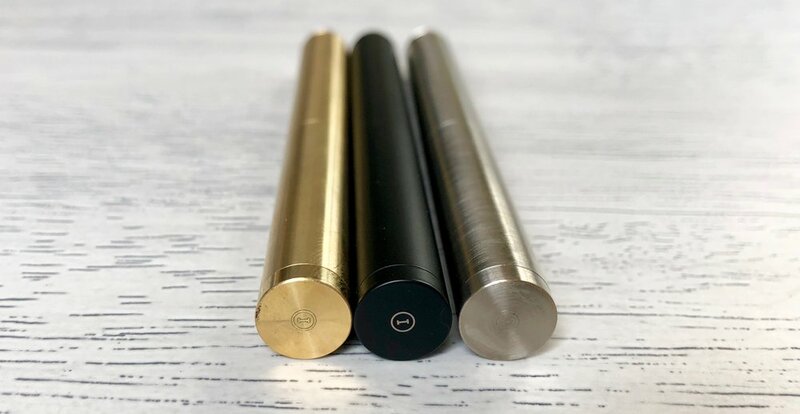 Last week, I took a look at the Tactile Turn Gist fountain pen, an excellent Kickstarter pen that's now available to the general public. The Gist comes with Bock nib material options, steel, titanium, and gold, and I thought that it would be fun to try a titanium nib. This is my first titanium nib, and I chose the fine version. Unlike the shiny stainless steel nibs, the titanium has a darker, tarnished color. This pairs well with certain pens and compliments the distressed look of my Gist's copper grip and finial. Bock nibs are etched with the Bock logo and intricate spiral designs. These are beautiful on their own, but the designs really shine when ink smears on the nib and fills them in. The Bock titanium nib has significantly more flex than a steel nib, resulting in a moderate amount of line variation with different writing pressure. The fine-nib version still functions well as an everyday writer, even though it can be pushed to offer a significant amount of flex. The flex does cause the nib to burn through ink very quickly, which doesn't pair well with smaller-capacity converter-fill pens, such as the Gist. Expect to fill the converter every few days or so, even with only a moderate amount of use. The titanium nib glides smoothly across the paper, with minimal resistance. Although the nib is smooth, I occasionally experience skipping and hard starts, after longer writing periods. There were several occasions where I even had to unscrew the barrel to push ink through the converter and prime the nib. 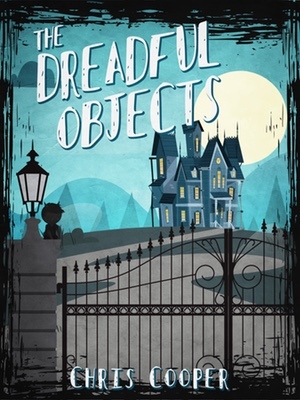 The issues were frequent enough to break my writing flow and cause annoyance, which makes it difficult to recommend the nib without reservations. This can be alleviated, somewhat, by choosing an ink that flows easily. The Bock titanium nib is fun for short bursts of stationary writing. Its flex is enough to leave moderate line variation without gushing ink onto the page. The nib falters during long writing sessions, and the soft titanium material makes it a poor choice for an everyday carry pen that may see unstable environments or even the occasional drop. Although I don't plan to fill my pen arsenal with titanium nibs, I'm glad to have one in rotation. Most don't choose fountain pens because they're incredibly convenient and versatile, and there's something to be said for the titanium nib's unique performance and aged appearance. It's certainly worth a try, even if it isn't destined to travel with you on a daily basis. So this is all well and good, but how do I buy one? Here are a few links to pens that offer Bock titanium nib options. Most offer separate nib purchases, in case you already own the pen itself. This isn't all inclusive, since many pen manufacturers use Bock nibs. 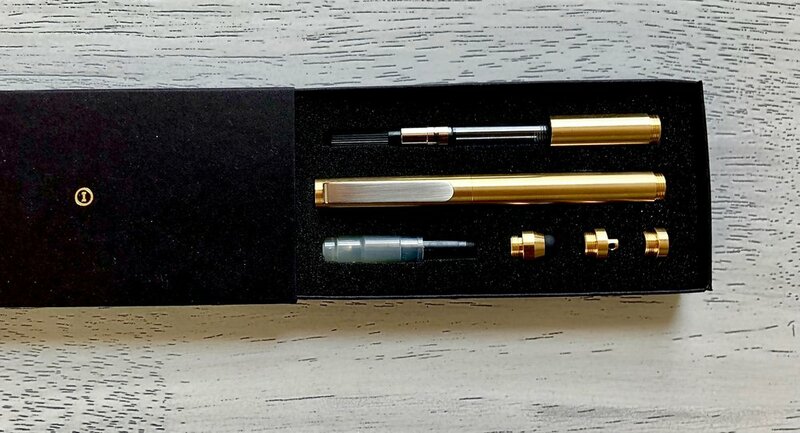 Karas Customs Ink Fountain Pen - $140 with titanium nib. Great review by Pen Habit. Tactile Turn Gist - Starting at $159 with titanium nib. Conid Minimalistica - The large capacity is perfect for satiating a titanium nib's ink hunger. Great review from The Gentleman Stationer. Don't look unless you're prepared to drop $400. Don't forget to check out my original review of the Tactile Turn Gist.